During last year's concert, our conductor asked me and another UPCC Alumna, Tita Ritzi to share the solo for the Christmas song "Payapang Daigdig". It had been a long time since I last sang with the UPCC then and so I was really honored to have been asked. This year though, I'm not sure if I will be able to make it. I'm bummed about that. But we'll see how it turns out. Hopefully I still get to go. :) In the meantime, here are the lyrics to "Payapang Daigdig". And for my non Tagalog speaking readers, a semi-literal translation: "Peaceful World". Even the twinkling of stars is silent. fell in love with the peacefulness of the world. Peace is the reason why we are alive. ...oh, the silence of the night. 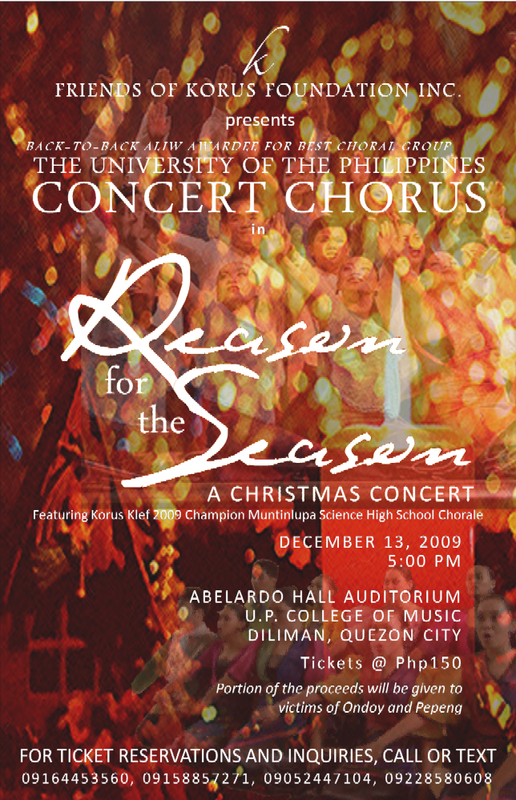 I am inviting you all to come and watch the 5-time Aliw Awardee The UP Concert Chorus in "Reason for the Season", a Christmas Concert on December 13, 2009, Sunday 5:00PM at the University of the Philippines College of Music, Abelardo Hall Auditorium. This concert also serves as the annual Alumni Homecoming of the UPCC (that includes me hehe). A portion of the show's proceeds will be donated to the victims of typhoons Ondoy and Pepeng.